The medical name for cradle cap is seborrhoeic dermatitis. it is believed to be linked to overactive sebaceous glands in the scalp which produce an oily, waxy substance called sebum (teehee can’t help but giggle everytime I read that word, child that I am!). More often than not cradle cap is found on the scalp but it can also appear on the face, ears and neck, on the backs of knees and even in the armpits! All mine had a touch of it behind their ears as well on on their heads. Cradle cap is really easy to recognise by the scaly patches of greasy, yellow or brown build up on the scalp. Your baby might get away with a small patch, but many babies get it covering the entire top of the head. There are quite simple ways to remove cradle cap without causing any harm or distress to your child. Firstly, bathe them as usual and wash their hair with your usual shampoo, let them play for a bit while the warm water softens the cradle cap. For small patches that are not very thick you may be able to just use a flannel (that’s a washcloth for our American friends) to gently rub the scalp in circular motions. Many parents also use a toothbrush to great effect. For really stubborn cases you might have to do this over a few bath times to get it all off. Sometimes, when cradle cap is loosening it has a tendency to get stuck in the hair, especially if the scales are quite thick. When this happens you can gently use a nit comb to get rid of it. Some people also use a nit comb to loosen the build that’s still attached to the scalp, if you do try this, do it very gently and just to brush over the top layer, don’t go trying to pull it up right from the scalp or you might damage the skin below. Try not to pick it! Especially while the scalp is dry, this can damage to the skin below. You can use an oil like olive, coconut or simply even sunflower oil massaged into the scalp to soften the build up. Do this at least 30 minutes before you bath your baby, or even overnight if you don’t mind greasy bedding! DON’T Panic!!! It is normal for hair to come out with the scales! More often than not, this is hair that has already technically ‘fallen out’ but is caught in the cradle cap instead of just falling away as it normally would. * Oh, and back to that usually. Slight redness is normal with cradle cap, especially if you are actively trying to remove it. But sometimes the scalp can get extremely red, inflamed or even weep. This is usually because your baby has scratched their head or some of the cradle cap has been knocked damaging the skin below allowing bugs to get in. If this happens, take your baby to get it checked out. There are topical ointments, anti-bacterial or anti-fungal, that your doctor can prescribe which will help clear it up. O had a really nasty allergic reaction to something when he was about one which caused his cradle cap to get infected because he was scratching. We were prescribed fucidin and it was back to normal within the week. He is now two but still has the cradle cap! 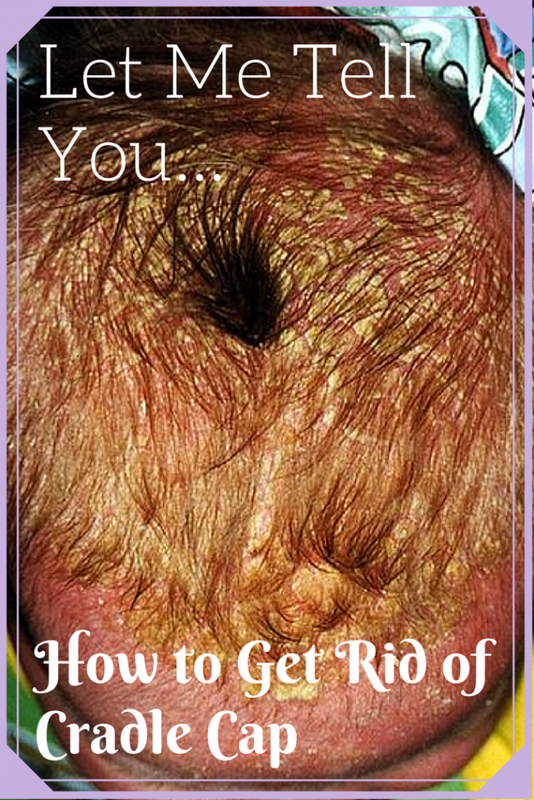 Have you had babies with cradle cap? Did it clear up by itself?